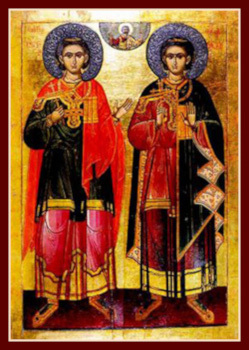 The Holy Martyrs Sergius and Bacchus were appointed to high positions in the army by the emperor Maximian (284-305), who did not know that they were Christians. Malevolent persons made a denunciation to Maximian, that his two military commanders did not honour the pagan gods, and this was considered a crime against the state. The emperor, wanting to convince himself of the veracity of the denunciation, ordered Sergius and Bacchus to offer sacrifice to the idols, but they answered that they honoured but the One God and Him only did they worship. Maximian commanded that the martyrs be stripped of the insignia of military rank, and then having dressed them in feminine clothing to lead them through the city with an iron chain on the neck, for the mockery by the people. Then he again summoned Sergius and Bacchus to him and in a friendly approach advised them not to be swayed by Christian fables and instead return to the Roman gods. But the saints remained steadfast. Then the emperor commanded that they be dispatched to the governor of the eastern part of Syria, Antiochus, a fierce hater of Christians. Antiochus had received his position with the help of Sergius and Bacchus. “My fathers and benefactors!” he addressed the saints, “Have pity not only upon yourself, but also on me: I want not to condemn ye to martyrdom.” The holy martyrs replied, that for them life is Christ, and death for Him its acquisition. In a rage Antiochus ordered Bacchus to be mercilessly beaten, and the holy martyr expired to the Lord. They shod Sergius with iron shoes inset with nails and sent him off to another city, where he as beheaded with the sword (c. year 300).